Plastic paint palettes are available in a wide variety of configurations. Most of these palettes have been designed by well known watercolor artists. Wells to hold paint are usually lined up along the edge of the palette with a larger mixing area in the center. Some are even designed with larger wells so that they will fit large wash brushes easily. 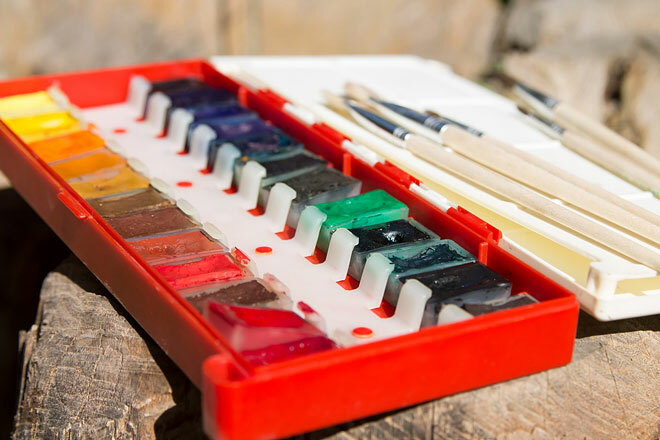 While watercolor paints may stain the white plastic, these palettes are easy to clean, and the paints keep fresh when the companion lid is snapped on. Some artists find it convenient to keep more than one of these palettes with different paint color collections in each. John Pike Art Products has popular Styrene palettes; one of them is designed with big wells.